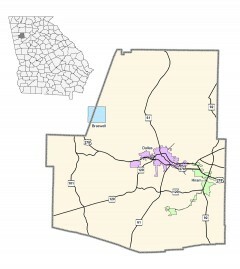 Paulding County, the 87th county created in the state, was formed from part of Cherokee County. It was named after John Paulding, a soldier in the Revolutionary War who helped capture Major Andre, an accomplice in Benedict Arnold’s plot to overthrow the nation. The county courthouse, built in 1892, is listed on the National Register of Historic Places. Another historic site is Pickett’s Mill, a very well preserved Civil War battlefield. In the Atlanta Campaign, Sherman’s forces clashed with Confederates here prior to heading to Kennesaw.